Philanthropist Barbara Nicklaus, wife of golfer Jack Nicklaus, mother of five, and grandmother to 22 grandchildren, was recognized with the Keys to the City of Palm Beach Gardens, Fla., for her ongoing efforts to improve access to pediatric healthcare in the community where the Nicklauses have lived for 50 years. Presentation of the Keys to the City to an individual is the highest honor the City of Palm Beach Gardens, Fla. can bestow. Barbara and Jack are co-founders of the Nicklaus Children’s Health Care Foundation, whose mission is to provide charitable support for activities that advance and enhance the diagnosis, treatment and prevention of childhood diseases and disorders. The Nicklaus Children’s Health Care Foundation also supports not-for-profit programs and projects aimed at pediatric health care and health-related services. It is approaching $50 million raised in just over 11 years. In 2012, the Nicklaus Children’s Health Care Foundation opened a pediatric outpatient center that provides urgent care, diagnostic services, rehabilitation services, and subspecialty medical services in Palm Beach Gardens in partnership with the Miami Children’s Health Foundation. Then, in March 2015, Miami Children’s Hospital and its network of eight outpatient centers (and counting) were rebranded to Nicklaus Children’s Hospital in recognition of Jack and Barbara’s fundraising efforts. Most recently impacting her local community, Barbara was instrumental in the opening of the De George Pediatric Inpatient Unit at Jupiter Medical Center–a town in the same South Florida community as Palm Beach Gardens. Barbara has also been a leading force in The Honda Classic’s partnership with the Nicklaus Children’s Health Care Foundation. The popular PGA Tour stop, played at the Jack Nicklaus redesigned Champion Course at PGA National Resort & Spa in Palm Beach Gardens, had a record attendance in 2016. While a charitable figure for this year’s tournament has not yet been announced, last year’s event raised a record $2.555 million for 44 children’s charities, impacting the lives of approximately 15,000 children in the community where the Nicklauses live and work. In 2015, Barbara was recognized with the United States Golf Association’s highest honor, the Bob Jones Award–making Jack and Barbara the only married couple to independently receive the award in USGA history. The first family of golf were winners in separate years of the PGA Tour’s Ambassador of Golf Award. 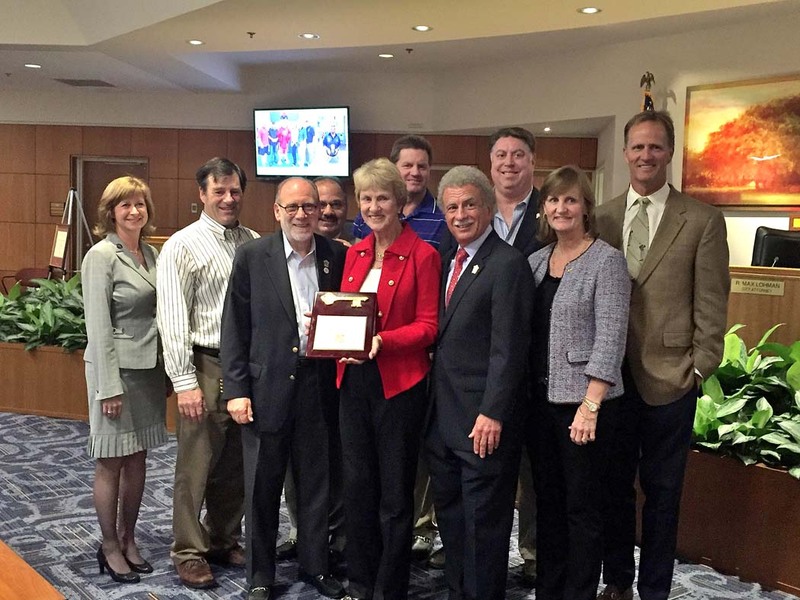 Jack and Barbara were also recognized in 2015 with the Gaeta Chairman’s Award of Excellence from the Northern Palm Beach County Chamber of Commerce, honoring their help in providing the framework of the Northern Palm Beach County community.